Purchase speaks to increasing importance of bringing UC and contact center together in one portfolio. 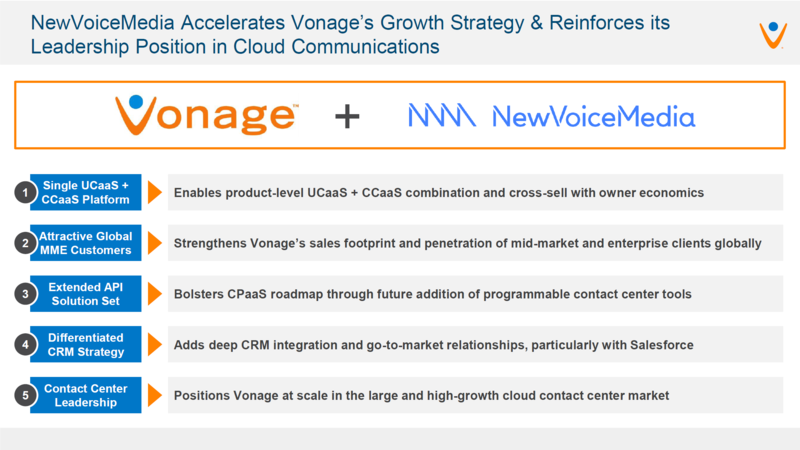 Vonage today announced its intention to acquire privately-held cloud contact center company NewVoiceMedia for an equity price of $350 million. On deal closing -- expected in fourth-quarter 2018 -- NewVoiceMedia will bring 430 contact center-centric employees, 700+ customers, and seven global points of presence to Vonage. The purchase is evidence of the strategic importance unified communications-as-a-service (UCaaS) companies place on having a strong contact center-as-a-service market (CCaaS) play. In a January post, I quoted NewVoiceMedia's then-new CEO, Dennis Fois, as saying: "The problem that NewVoiceMedia is trying to solve is the role of the contact center in the digital transformation process that companies are undertaking to respond to the pressures of the experience economy." With this acquisition by Vonage, the solution for NewVoiceMedia is to become an integral part of a larger suite of enterprise communications software. As Vonage has often stated, it believes companies can realize synergies when they choose a single provider for their UC, contact center, and communications platform needs. "We have seen strong customer demand for integrated UCaaS and cloud contact center solutions, particularly among mid-market and enterprise customers. To date, we have addressed this demand by integrating third-party contact center solutions. By owning NewVoiceMedia, we can more deeply integrate our products and deliver a superior solution versus competitive offerings," Vonage CEO Alan Masarek said this morning in a call with financial analysts. "With NewVoiceMedia, we are accelerating our strategy to create OneVonage, our combined, microservice-based, cloud communications platform," Masarek went on to say. "With OneVonage, we will provide solutions, all fully programmable, that range from packaged applications like PBX, contact center, collaboration, and team messaging to programmable communication APIs." As Masarek alluded, Vonage is not new to the contact center market. Since 2013, it has been reselling NICE inContact's CCaaS solution, and in fact, expanded that relationship in June 2018. It also offers a call center solution (think voice-only) that's based on functionality embedded in its BroadSoft BroadWorks platform. What, if anything will happen to the NICE inContact partnership? Vonage will continue to partner with NICE inContact to meet the needs of two types of companies, Vonage Chief Revenue Officer Kenny Wyatt told me in a discussion we had about the acquisition. These would be companies that aren't users of Salesforce Service or Sales Cloud or other CRM companies with which NewVoiceMedia has deep integrations (e.g., SAP and ServiceNow), and those whose requirements don't match with those available from NewVoiceMedia today. The question of whether a prospect is a Salesforce user or not comes into play because, since 2014, NewVoiceMedia has primarily targeted and sold its solutions to companies that are also customers of Salesforce. While that may at first blush look like a limiting strategy, Vonage shared information during the financial analyst briefing call today that NewVoiceMedia revenue grew more than 27% year over year in first-half 2018. I ended my January post about NewVoiceMedia saying, "We'll be seeing a lot more of NewVoiceMedia in North America in 2018 than we have in the past, and likely reading about them a lot more here on No Jitter." With this acquisition by Vonage, both predictions are made true.